Have you been affected by rural suicide? Have you managed your own poor mental health or cared for someone with a mental health condition? Would you be interested in joining a group of like-minded farmers to tell your story to help reduce stigma and benefit others in the rural community? The NCFH are running more FREE digital storytelling workshops. We can help get you there and provide you accommodation. We just need you and your story to make a difference. Young farmers/farming family members aged 18-30 years are strongly encouraged to participate, but we welcome everyone to get in touch. Interested? Download this expression of interest form. Share this flyer with your rural networks—print, email or social media. Printable PDF download 2mg. Opportunity to increase knowledge and literacy about the lived experience of suicide (challenging suicide myths and framing experience in a contextual way, facilitating help-seeking where required). The Ripple Effect is funded by beyondblue with donations from the Movember Foundation. It is a partnership led by the National Centre for Farmer Health (NCFH), with support from Deakin University, Victorian Farmers’ Federation, AgChatOZ, Sandpit, Western District Health Service and Mental Illness Fellowship North Queensland. Read the Ripple Effect Research Protocol here. Susan Brumby is a registered nurse and midwife and has held executive positions in rural health services. She has also been actively involved in agriculture, running the family beef and wool property for twelve years. Combining these two passions, (health and agriculture) Sue led an innovative and award- winning program called Sustainable Farm Families (SFF), which has been taken across Australia and more recently Alberta, Canada. In 2008 Sue commenced as founding Director of the National Centre for Farmer Health—a partnership between Western District Health Service and Deakin University. She is the course leader for the Graduate Certificate in Agricultural Health and Medicine, PI of the award winning SFFTM project, Chief Investigators on National Health and Medical Research Council grants and previously CI on Australian Research Council, Rural Industries Research Development Corporation and beyondblue grants. Sue has been recognised for her contribution to rural health, awarded a Victorian travelling fellowship in 2006 and an overseas study program in 2013 to examine farmer health. Her PhD was on Farm Work and Family Health across selected Agricultural Industries in Australia. In 2014 her team was awarded the Vice-Chancellors award for Excellence in Teaching. She is member of the Victorian Agriculture Advisory Council that advises the Minister for Agriculture on matters such as rural adjustment, regional issues, training, drought and other matters as requested by the Minister. She has presented and published nationally and internationally. Alison has lived and worked in Victoria’s rural farming community for the past 12 years. Her 5-year role at the National Centre for Farmer Health (NCFH) has included research responding to alcohol misuse in farming communities, the coordination of the international photography competition ‘Celebrating Rural Life’, & the publication of ‘Sowing the Seeds of Farmer Health’—a compilation of peer-reviewed papers from the 2012 NCFH conference. Alison is about to submit her PhD thesis for examination exploring the impact that suicide & accidental death have on members of Australian farming families. 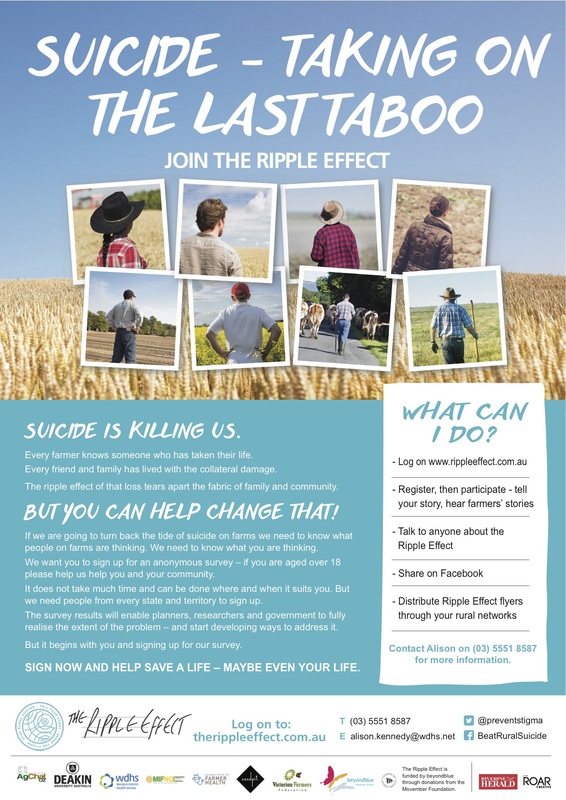 Alison’s work on the Ripple Effect enables her to draw on her academic training in behavioural science, her research experience and her lived experience of suicide bereavement in order to make a positive contribution to improving farmer’s lives. Katrina Myers was born and raised in Barham on a 1000 hectare mixed-practice farm. After attending boarding school in Ballarat, Katrina moved to Melbourne where she completed a Bachelor of Agricultural Science at Melbourne University and a Masters of Environmental Management and Economic Development at RMIT University. In late 2010, Katrina and her husband Tim returned to Barham, NSW to take over the fourth-generation family farm (which had since become Barham Avocados). They currently live in a converted bank building in the main street of Barham with their three children: Daisy, Chester and Poppy and chocolate labrador Moet. Katrina is actively involved in community groups and is a co-founder of the local Red Gum Food Group and Koondrook-Barham Farmers’ Market. Katrina brings personal experience to the group as she has experienced the effects of suicide first hand having lost her father to suicide when she was 15. Karen has been a family farmer for 39 years with partner Errol whist raising 5 children. Commencing work in Rural Community Development in 2007, after studying for and qualifying as a Counsellor, she worked with rural businesses and families till 2012. In this capacity she supported rural women and families both individually as well as group work. Actively Involved in the Queensland Rural, Regional and Remote Women’s Network (QRRRWN), she led her branch to be actively involved in various retreats and wellness days for farming women. In the past Karen has been a member of the South Burnett Regional Council Flood Recovery Flexible Funding Advisory Group, as well as a member of the Steering Group for the National Centre for Farmer Health ‘Shhh hearing in a farming environment’ program. Karen has also worked with SEB Landcare delivering workshops across the South Burnett. Director of the South Burnett Red Earth Community Foundation. Active member of primary production organisations in both beef and pig industries. Active member of Landcare groups and South Burnett Beef Group. Advisor to the Downs and West Community Support program. Maria is a psychologist with over 16 years’ experience. Working as a secondary school teacher early on in Maria’s career fostered her desire to learn more about behaviour. She then studied psychology, while raising a family on a beef and sheep property in East Gippsland. Maria has spent much of her working life in private practice in Bairnsdale and Sale, predominantly in diagnosis and treatment of trauma, depression and anxiety. Maria’s experience has given her great insight into suicidal ideation and in particular, the ability of some clients to be able to successfully challenge negative thoughts and feelings. A critical component to that success has been clients’ engagement in therapy, breaking down stigma associated with depression and suicide and robust social support. Through her work, Maria has developed a strong interest and commitment to the promotion of mental health, particularly in rural Victoria where she lives. Nick Shady is a fourth generation farmer from rural Victoria. He lives with his family in Ballarat and commutes to their farm which is about 65km from their home near the small town of Lismore. Nick has a Master’s in Business Administration and is the co-author of Who Gets the Farm: a practical guide to farm succession planning. Nick has a long history of serving his local community through his involvement the Beaufort & Skipton Health Service Foundation, the Skipton Recreation Reserve, Sports Central Ballarat and the Skipton Football Netball Club. 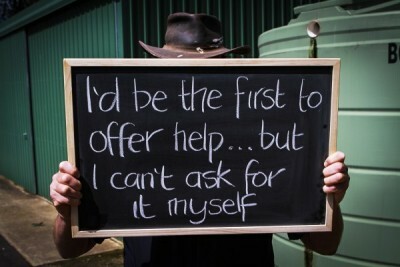 Rural health and wellbeing is a focus for Nick as he has been personally impacted by the stress of farming life and has lost friends to suicide. He is a proud supporter of Survivors of Suicide Ballarat and is passionate about suicide prevention as well as providing much needed support for those impacted by suicide. Tristan is a psychologist current working with survivors of trauma and torture with Foundation House. He developed his interest for mental health support and advocacy after working in acute psychiatry and juvenile justice. In 2012, Tristan was based in Hanoi, Vietnam training local staff in suicide prevention and crisis based counselling and developed a deep appreciation of the need for strong community supports and health education programs, particularly in rural areas. Since returning from this role, Tristan completed a Masters in Professional and Applied Ethics with a focus on ethical conceptions of mental illness and diagnosis. Tristan believes that the Ripple Effect will play a vital role in supporting rural people and furthering our understanding of the effects of mental health stigma. Martin Butler is a Social Worker with a wicked sense of humour who has worked across rural and remote Australia for over 30 years in mental/community health and educational settings. His extensive involvement in community development projects includes housing, Foodbank, carers support, community gardens and bushfire, drought and flood recovery. Martin has represented the Australian Association of Social Workers (AASW) at Federal and State Government enquiries on rural and remote community health issues around education, suicide prevention, allied health, family violence and men’s health. He also represents the AASW on Deakin University’s Social Work Advisory Academic Board. Martin has convened the AASW Rural Social Workers Action Practice Group for 25 years and has an AASW Scholarship named in his honour. Martin has worked in a range of farming areas—currently running Suffolk and Dohnes sheep—and has worked closely with the Victorian Farmers Federation. In May 2015, Martin was named as one of 20 Great Australians by R.M. Williams Outback magazine. Graeme commenced work for the VFF in 1997 as a Regional Manager. Appointed as Manager of the VFF Chicken Meat Group in 2003, Executive Manager Policy in 2005 and becoming CEO in 2011. Prior to the VFF, Graeme worked in his family’s farm business based in Central Victoria and the Wimmera. Graeme has formal qualifications of an MBA, a Masters of Applied Science in Agriculture and Rural Development, and a Graduate Diploma in Rural Resource Management. He has completed the General Management Program at Harvard Business School and the AICD Company Directors Program. Graeme is passionate about agriculture and supporting the people involved. He has been heavily involved in the VFF’s disaster response efforts which included running major bush fires fodder relief programs in 2003, 2006 and 2009. John grew up on a family farm in Victoria and moved to Melbourne to complete a Bachelor of Chemical Engineering—leading him to work and live in Tasmania. After recovering from serious burnout several years ago, John commenced work with Anglicare as a Family Mental Health Outreach Worker supporting families affected by a mental health condition. John now works as an Outreach Worker for Rural Alive and Well (RAW), is a beyondblue and Suicide Prevention Australia speaker and has been on the consumer reference group for Children of Parents with Mental Illness (COPMI). John is passionate about reducing stigma and encouraging people to get help for themselves, their families and their mates. John is a passionate family man and, when not out and about talking to mates, you can find John bushwalking Tasmania’s mountains; fly fishing the pristine lakes; hunting and woodworking. Whenever possible, John gets back to the family farm because there’s never an end to the work to be done. Steve has operated his own cattle and sheep properties and managed several large stations over the past forty years. He supplemented the farm income with tourism—operating 2-7 day horse trail rides in the Victorian High Country, as well as building and managing Mansfield Zoo. More recently, a serious farm accident almost claimed his life and left him seriously debilitated. Living with inoperable severe chronic pain, Steve has suffered at times from depression. The only thing that has saved him has been having a strong partner for support. Having had several farming friends die by suicide, Steve is passionate about changing the system to prevent this from happening for as many farmers that can be reached. He believes that current prevention methods are just not working in the rural sector. Steve was a founding member and President of Flowerdale Men’s Shed, established as an informal way to reach out to these men. Ross Romeo was a cane farmer for over 30 years. He is still involved in the industry in The Burdekin where he has lived all his life. One of his jobs currently is the Qld Co-ordinator for CORES Australia, a not for profit community organisation focussed on suicide prevention. Ross got involved with CORES after losing his best mate to suicide in 2005. He is also a qualified counsellor & works as a school chaplain. Alison Fairleigh is a passionate advocate for rural mental health and farming communities. In 2013, Alison was chosen as the RIRDC QLD Rural Woman of the Year for her advocacy in improving rural mental health services and suicide prevention, and it is her mission to ensure that mental health is seen to be just as important as physical health within the agricultural sector. Alison has successfully used social media to shine a light on life in rural and remote Australia and is passionate about empowering others to find their voice through this powerful medium. Alison is currently the Townsville Area Manager at the Mental Illness Fellowship of North Qld where she is working to deliver drought assistance programs in northwest Qld. Alison is also an Australia Day Ambassador representing the Australia Day Council in outback communities. Dan Koerner and Sam Haren are co-founders and creative directors of Sandpit, founded in 2012. Dan and Sam have diverse experience in creating live events, screen media, digital content and developing new technologies. Sandpit has designed multiplatform extensions for feature films 52 Tuesdays, The Boy Castaways and has directed an interactive audio tour experience I, Animal for Melbourne Zoo. Sandpit recently created an interactive phone booth project Dial-A-Story with Penguin Books, and Windmill Theatre on their forthcoming performance—and feature film—Girl Asleep. In 2013, Sandpit spoke at Transmedia Hollywood in Los Angeles, and in 2012 spoke at Arts Participation Incubator’s ‘Technologies for Participation’ Seminar at MONA. Sandpit has been part of Screen Australia’s Multi-Platform Clinic, and Screen Australia and the Australia Council for the Arts’ Hive Lab during the 2012 Melbourne Festival. Kylie Robertson is multi award-winning practitioner, expert and sought-after speaker in the field of interactive and transmedia storytelling. She is the creator of pioneering interactive projects Jupiter Green and Girl Friday and has won numerous Australian and international awards for innovation and artistic achievements. Kylie originally progressed to international recognition as an interactive filmmaker with her film ‘Silent Passages’ which won a spot at MILIA Cannes and festivals around the world. Kylie is currently Head of Creative, Digital & Emerging Products for Penguin Books Australia working in innovation and strategy development across marketing and digital teams.